Subscribe now to the Ask Leo! Newsletter! Subscribe to The Ask Leo! 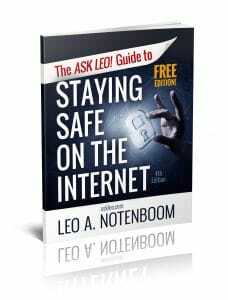 Newsletter and get a copy of The Ask Leo! Guide to Staying Safe on the Internet – FREE Edition. This ebook will help you identify the most important steps you can take to keep your computer, and yourself, safe as you navigate today’s digital landscape. Then each week in The Ask Leo! Newsletter you’ll get even more tips, tricks, answers and ideas to help you use your technology more effectively and stay safe doing so.